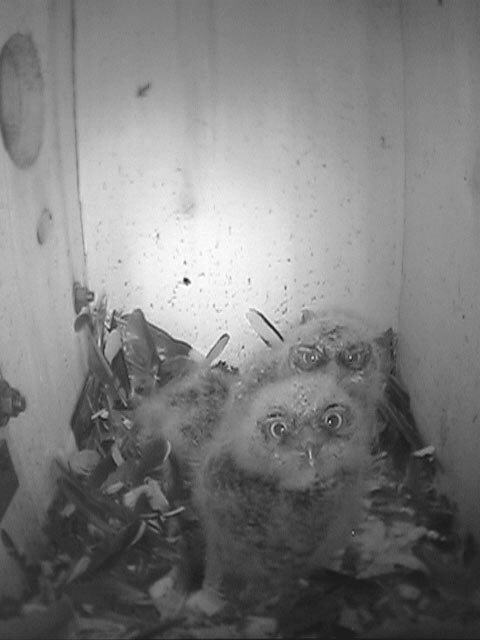 The owlets are now about 21 days old. They look like tiny ostriches when they stretch their necks and heads up and rotate their faces. Staring straight into the camera, they do not know they are being watched. The owl box is the only world they know, with its cedar shavings and scattered feathers. They peck at bugs and leftovers from last night’s dinner. Their mother clucks to them during the day and covers them with her broad wings. They appear to be almost one-third her size, but size is relative in the camera’s eye and difficult to determine. In a video, the female might as well be a great-horned owl. 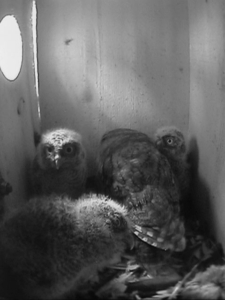 At night, both parents shuttle food to the owlets, diving through the entrance and dropping off geckos, snakes, moths and sometimes large or small birds. The mother feeds them carefully, stopping and pecking at food; she seems to be considering which owlet has eaten and if they have had enough. The male shoots through the entrance and drops off a moth or a bug or a snake to the first lucky owlet to grab it. He doesn’t stick around long enough to know who got what. 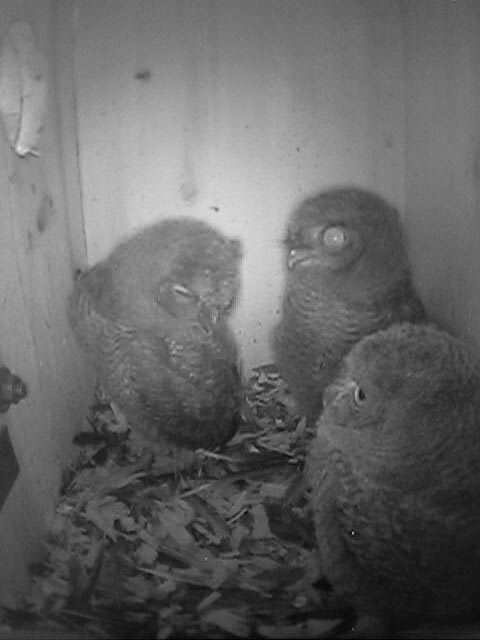 Still, all three owlets seem to be well fed and about the same size. A killdeer has nested at the barn again, this time under a log in the sand arena. The end of the jagged log, about 1-1/2 – 2 feet high, is blocked by a wooden box used as a jump to shield the nest from horses and riders. While the female sits on the four speckled eggs, the male scurries around screeching, trying to distracting predators, which would be us. Other birds are protecting their nests too. A small bird flew after a hawk, soaring over Willis’ paddock, flapping its wings. The hawk sat on the ribbon fence and alternately hopped to the ground, waiting for a chance to invade. It was only about 26 yards away when I first saw it. I stood there in amazement; I have never been that close to hawk before, and I admired its brown and white feathers and its size. Flocks of cattle egrets visit, too, white spots in the turnouts and pastures along the road, while roadrunners, speed across the entrance to the barn. Pollen falls on the deck, river rock, everywhere. This fall for should be a good year for pecans. Video of the mother and father feeding the owlets at 15 days.